Did Casey Mulligan ever spend any time in the real world? Mulligan’s point apparently is that the Federal Reserve is not able to influence financial markets and as a consequence monetary policy is impotent. First of all we have to sadly conclude that monetarism is nonexistent at the University of Chicago – gone is the wisdom of Milton Friedman. I wonder if anybody at the University of Chicago even cares that Friedman would have turned 100 years in a few days. Anyway, I wonder if Casey Mulligan ever spent any time looking at real financial markets – especially over the past four years. I have in a number of blog posts over the last couple of months demonstrated that the major ups and downs in both the US fixed income and equity markets have been driven by changes in monetary policy stance by the major global central banks – the Fed, the ECB and the People’s Bank of China. I could easy have demonstrated the same to be the case in the global commodity markets. Maybe Casey Mulligan should have a look on the two graphs below. 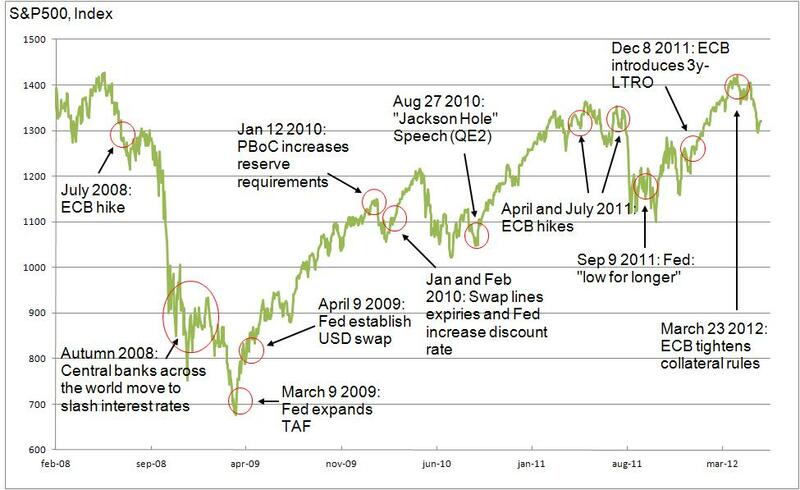 I think it is pretty hard to NOT to spot the importance of monetary policy changes on the markets. Of course it would also be interesting to hear an explanation why banks, investment funds, hedge funds etc. around the world hire economists to forecast (guess?) what the Fed and other central banks will do if monetary policy will not have an impact on financial markets. Are bankers irrational Professor Mulligan? Anyway, I find it incredible that anybody would make these claims and it seems like Casey Mulligan spend very little time looking at actual financial markets. It might be that he can find some odd models where monetary policy is not having an impact on financial markets, but it is certainly not the case in the world I live in. Yes, indeed – Friedman would have been very upset by the fact that University of Chicago now is an institution where money doesn’t matter. It is sad indeed. Recently I have been thinking whether it would be possible to understand all financial market price action through the lens of the equation of exchange – MV=PY. In post I take a look at the bond market. A common misunderstanding among economic commentators is to equate easy monetary conditions with low bond yields. However, Milton Friedman long ago told us that bond yields are low when monetary policy have been tight – and not when it has been loose. Any Market Monetarist will tell you that monetary conditions are getting easier when nominal GDP growth is accelerating and and getting tighter when NGDP growth is slowing. So with this Friedmanite and market monetarist insight in mind there should be a relationship between higher bond yields and higher nominal GDP growth. Hence, when market participants expect MV to increase then we should also see bond yields increase. 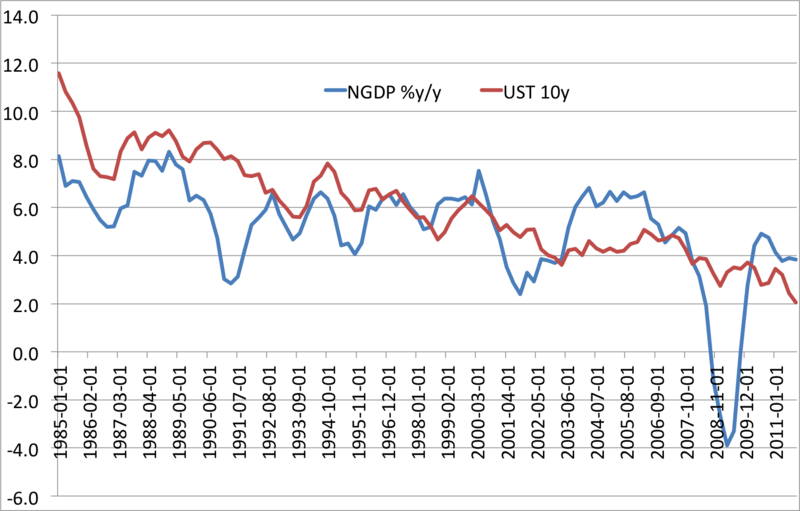 The graph above shows the correlation between 10-year US bond yields and US NGDP growth. The graph illustrates that there is a fairly close correlation between the two series. Higher bond yields and higher NGDP hence seem to go hand in hand and as we know MV=PY we can conclude that higher bond yields is an indication of looser monetary policy. Furthermore, we should expect to see bond yields to increase – rather than decrease – when monetary policy is eased. Or said in another way – any monetary action that does not lead to an increase in bond yields should not be considered to be monetary easing. Therefore, given the present slump we are in we should not be worried that rising bond yields will kill off the recovery – rather we should rejoice when long-term bond yields are rising because that is the best indictor that monetary conditions are becoming easer and that that will push up nominal GDP. The brief discussion above in my view confirms some key market monetarist positions. First, financial markets are good indicators of the stance of monetary policy. Second, monetary policy works through expectations – with long and variable leads. Third low bond yields is an indication that monetary policy has been tight and not that it is loose. UPDATE: In my original post I had used some wrong data. Clare Zempel kindly notified me about the mistake(s). I am grateful for the help. As a consequence of the wrong data I have revised part of the original text. UPDATE 2: David Beckworth has an excellent post arguing the exactly the same as me: “the recent rise in long-term yields can be interpreted as the bond market pricing in a rise in the expected growth of aggregate demand.”. And take a look at David’s graph showing the relationship between expected NGDP growth and 10-year bond yields. Great stuff! Scott Sumner and other Market Monetarists (including myself) favour the use of NGDP futures to guide monetary policy. Other than being forward-looking a policy based on market information ensures that the forecast of the future development is not biased – in the market place biases will cost you on the bottom-line. Similarly, I have earlier suggested that central banks should use prediction markets to do forecasting rather rely on in-house forecasts that potentially could be biased due to political pressures. A common critique of using “market forecasts” in the conduct of monetary policy is that the market often is wrong and that “herd behaviour” dominates price action – just think of Keynes’ famous beauty contest. This is the view of proponents of what has been termed behavioural finance. I have worked in the financial sector for more than a decade and I have surely come across many “special” characters and I therefore have some understanding for the thinking of behaviour theorists. However, one thing is individual characters and their more or less sane predictions and market bets another thing is the collective wisdom of the market. My experience is that the market is much more sane and better at predicting than the individual market participants. As Scott Sumner I have a strong believe in the power of markets and I generally think that the financial markets can be described as being (more or less) efficient. The individual is no superman, but the collective knowledge of billions of market participants surely has powers that are bigger than superman’s powers. In fact the market might even be more powerful than Chuck Norris! Economists continue to debate the empirical evidence of market efficiency, but the so-called Efficient-Market Hypothesis (EMH) can be hard to test empirically. However, on Thursday I got the chance to test the EMH on a small sample of market participants. I was doing a presentation for 8 Swedish market participants who were on a visit to Copenhagen. I knew that they had to fly back to Stockholm on a fight at 18:10. So I organized a small competition. I asked the 8 clever Swedes to write down their individual “bets” on when they would hear the famous words “Please fasten your seatbelts” and the person who was closest to the actual time would win a bottle of champagne (markets only work if you provide the proper incentives). “Fasten your seatbelts” was said at 18:09. The “consensus” forecast from the 8 Swedes was 18:14 – a miss of 5 minutes (the “average” forecast was 8 minutes wrong). Not too bad I think given the number of uncertainties in such a prediction – just imagine what Scandinavian winter can do to the take-off time. What, however, is more impressive is that only one of the 8 Swedes were better than the consensus forecast. Carl Johan missed by only 1 minute with his forecast of 18:08. Hence, 7 out 8 had a worse forecast than the consensus forecast. Said in another way only one managed to beat the market. This is of course a bit of fun and games, but to me it also is a pretty good illustration of the fact that the collective wisdom in market is quite efficient. I showed the results to one of my colleagues who have been a trader in the financial markets for two decades – so you can say he has been making a living beating the market. The first thing he noted was that two of the forecasts was quite off the mark – 14 minutes to early (Erik) and 14 minutes to late (Michael). My colleague said “they would have been dead in the market”. And then he explained that Erik and Michael probably went for the long shot after having rationalized that they probably would not have any chance going for the consensus forecast – after all we were playing “the-winner-takes-it-all” game. Erik and Michael in other words used what Philip Tetlock (inspired by Isaiah Berlin) has called a Hedgehog strategy – contrary to a Fox strategy. “Foxes” tend to place their bets close to the consensus, while “hedgehogs” tend to be contrarians. My colleague explained that this strategy might have worked with the “market design” I had set up, but in the real world there is a cost of participating in the game. It is not free to go for the long shot. This is of course completely correct and in the real market place you so to speak have to pay an entrance fee. This, however, just means that the incentive to move closer to the consensus is increased, which reinforces the case for the Efficient-Market Hypothesis. But even without these incentives my little experiment shows that it can be extremely hard to beat the market – and even if we played the game over and over again I would doubt that somebody would emerge as a consistent “consensus beater”. From a monetary policy perspective the experiment also reinforces the case for the use of market based forecasting in the conduct and guidance of monetary policy through NGDP futures or more simple prediction markets. After all how many central bankers are as clever as Carl Johan? PS Carl Johan works for a hedge fund! PPS if you are interested in predictions markets you should have a look at Robin Hanson’s blog Overcoming Bias and Chris Masse’s blog Midas Oracle. UPDATE: See this fantastic illustration of the Wisdom of the Crowd. Update 2: Scott Sumner has yet another good post on EMH.